In this thought-provoking look at what's really important in life, John Ortberg uses games as a metaphor to help us recognize and play for life's real prize: being rich toward God. 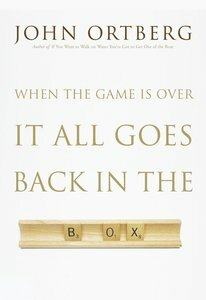 Told with humor and wisdom by this bestselling author, pastor, and game-strategist, When the Game is Over It All Goes Back in the Box reminds us that everything on earth belongs to God, and everything we "win" is just on loan. Being Master of the Board is not the point; playing by God's rules is. Ortberg makes sure we understand the object of the game, but he also walks us through the set-up, the rules, the strategies, and choosing the right trophies. This book is for those who want to sort out what's fleeting and what's permanent in God's kingdom. It's the perfect playbook for individuals or groups interested in considering life's true priorities and arranging their lives with eternal prizes in mind. About "When the Game is Over, It All Goes Back in the Box"